Can You Stop Facebook From Tracking Your Location? As I mentioned in the intro, using the "location history" option in the "Settings and Privacy" area of the app won't stop Facebook from tracking the physical location of your phone. Ah, but if you tell your phone to “never” share your location with the Facebook app, that will do the trick. Right? Wrong again. 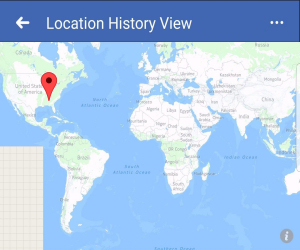 No matter what you do, Facebook always will know your current IP address, which reveals where you are connecting to the public Internet. Typically, on a mobile device that’s either a nearby cell tower or a WiFi access point in a specific building. That’s not close enough for a drone strike, but it is close enough for targeting of retail, restaurant, and other location-sensitive ads. Other “things” Facebook uses to divine your location may include photos in which you are tagged, if the photos include metadata about where they were taken. If your phone’s GPS service is enabled, crossing an invisible “geo-fence” may inform Facebook that you have entered or exited a defined physical area such as a tourist attraction, sports stadium, concert venue, or even a healthcare facility. A Long Island firm called Tell All Digital uses geo-fencing to help personal injury lawyers display ads to people in emergency rooms; the ads keep showing up on patients’ phone and other devices for up to two months. Such is ambulance-chasing in the Internet Age. A Massachusetts firm used geo-fencing to help a Christian pregnancy counseling and adoption agency display its ads to people in Planned Parenthood facilities. The State’s attorney general shut down that scheme using Massachusetts’ consumer protection law. Apparently, using someone’s location without their knowledge or consent to show them (presumably) unwanted marketing information is “unfair and/or deceptive” advertising in certain cases, but not all. The bottom line is that Facebook can and does estimate your location with a fairly high degree of accuracy no matter what you do to conceal your location. Location data that Facebook can’t collect itself can be obtained from firms like the aptly named Tell All Digital. So there really is no point in fiddling endlessly with Facebook's “Privacy Settings.” At best, you can only obscure your location enough to ensure the ads you will see are less relevant to you. Facebook seems to have created this illusion of “control” over your location data just to give users something to do, however pointless and counterproductive, rather than pressure lawmakers to force the company to take “no” for an answer when it asks permission to target ads based on your location. A growing number of consumers are opting out of the Faustian bargain that Facebook and other ad-supported social media services foist upon us. (Is that a "foistian bargain" then?) They are opting instead for WeMe.com, Mastodon, and other privacy-centric social networks that do not track their every move and sell access to advertisers. Most recent comments on "NO Doesn’t Mean NO To Facebook"
Let's not blame Facebook 100% for this nonsense. I never have had FB on my phone. And I turned off the account I had with them months ago. (Not sure if that really deletes the information they had built up about me.) But I still get tons of adds about places I have been near. Those seem to be connected to Google Maps, that is on the phone, and is aware of my location. However, being able to show where I was at some time might be useful. I live in a state that has one area that is constantly sending out traffic violations to vehicle owners that haven't been near that community in many years. Don't understand the fuzz. I don't see any ads at all. Ad-Muncher/Adblock/Ghostery/opt-out program and, of course, host with loopbacked ad-companies from winhelp2002.mvps.org. There are some drawbacks like broken links from some redirecting through ad-services sources, but it easy to oversmart. Of course, it doesn't stop collecting info about my activity. Well, I just don't do anything that can attract attention at devices without tricks to hide your location. You want to be invisible - be standard, just like millions of other users. And remember about "digital fingerprint" - unique set of programs and settings at your computer that is sent by your browser, so leave everything at defaults. Good luck to find anybody in a haystack. You want to hide your activity - use anonymizer + tor. It's the simplest way to be almost 99% sure you are invisible (according to experts from NSA). And I have Facebook. And I don't have any info about myself (like phone #) there except mandatory. And I use it at my stationary desktop. And, of course, the most strict security/privacy settings. Yes, I know, I'm paranoid. And as James E Shaneman, I'm ready for a knock on my door from two guys in black trench coats. Welcome to the new brave hel... err... world that we all created ourselves. Enjoy! Any chance that the AG for Massachusetts will go after Facebook next? Seems to me like they are violating that to a greater degree. Of course, their politics are in agreement so I won't hold my breadth. A good topic to bring up. But let's not pick on only Facebook. We all know Google does the same thing. But the evils of Google and MS never seem to be discussed here. Bob, near the end of the article, the name of MeWe.com is incorrect. The link is right, the name is wrong. It is listed in the article as WeMe.com. for those who don't know, your phone gives you away, whether or not you're using social media, and that includes shutting it off!!! The evils of Google and MS never seem to be discussed here. (Quote from comment above.) Actually, they are, to some extent. Facebook, however, is hated so much by so many (DEFINITELY including me) that it gets the most mentions. 1) Leans FAR left, restricting conservative views. 2) In spite of the above, will sell anybody's info to any group, including right-wing, if they have the money. 3) Precisely ZERO respect for anybody's privacy. And on and on. Oh yes, and on. No one has ever convinced me that this "invasion of privacy" is anything I need to worry about. I use Facebook to stay in contact with friends and relatives and more news sources that I would not be able to easily keep up with otherwise. I'm not sure why people are so incensed by the fact that ads can be targeted to them with a relatively poor degree of accuracy (usually after a purchase has already been made and is not likely to be repeated any time soon [I often get such offers from companies I have recently purchased from with 0% chance I am ready to repurchase again soon]). Are they unable to ignore the ads? Do they really feel compelled to buy what is presented in Ad form on their screens? I'm not bothered by that because every one of my devices; cell phone, iPad, computer, has a very potent ad-blocker, so I never get ads, nor do I worry about what FB might try because their ads can't get through. @KenH, I think you should be able to connect the dots and come up with an answer to your own question after browsing the yesterday's WSJ article about "What’s Worse Than Facebook?" Does the Facebook app on my iPhone tell Facebook my location if the app is closed? My facebook is from my home pc. My phone is and old flip phone that does not/or I have not turned on the wifi from it --do not know how. Bluetooth is available but it is not turned on either. So hopefully FB does not know any mobile for me. I do not use my kindle to search online. Only to download books from Amazon link. From only 3 places. So I am not overly worried...ps no phone listed for me on FB either. To snert: Don't be too paranoid. Your bank has your address, personal info and through info about use of your bank cards (debit or credit) they can spy on you without use of your phone. For example, you bought some coffee in Starbucks at 9:17 AM yesterday,so it's easy to get record from security cam there and see all people you've met there. Beware - Big Brother has been watching you way before cell phones were invented! I don't have FB on my phone, only on my PC. I don't put my personal information on my FB profile, but I do put ridiculously false data in my profile, just to mess with their saleable statistics. I knew they used that data when I posted my employment as trapeze artist with the Peking Circus and promptly received literally hundreds of friend requests from scantily-clad young "ladies" in China, and they were not all circus acts neither. To avoid the targetted ads from FB stealing my browser history, I use a separate browser just for FB. Bob, I would like to point out the YOUR page is displaying an ad this morning for a fitness machine I looked at last night on my laptop. Facebook is also displaying an ad for this machine on my iPad. The iPad ad is a bit spooky - I suspect a Google connection? My computer is a Windows machine, so it's not an Apple connection. I'll admit to not having explicit ad-blocking apps, though. As someone else pointed out, a lot of times such ads are displayed for something I just purchased and am not likely to purchase again any time soon! There is no such thing as a free lunch, or a free website. They all cost money to provide and therefore have to be paid for. The currency for that payment is advertising. If everyone used an ad-blocker, then the 'free' sites would either have to start charging, find ways to defeat ad-blockers, or go out of business. Given that we are stuck with the advertising, surely it is better to see ads for things that at least might be of interest rather than random ads for things that are totally irrelevant. To Tim Auger: Yes, nothing is free. But everybody has a choice. The moment a site asks me to turn off ad-blocker I include that site to my personal black list and never visit it again. Same thing for news - some newspapers try to force to subscribe to them when I open their article through link, for example, from Google News, so they instantly go to "exclude source list" and I never see any articles from them any more. The Internet is too big to miss any info. The same info I will find somewhere else. But interpretation of that would be from the source I found, not from the greedy publisher that tried to squeeze money from me restricting access to their version of info. So essentially they try to force me to pay for their point of view. This is the only addition to the info they can offer. They want me to know their point of view - pay me for that. But instead, they want me to pay them. Sorry pals, info is free. See, this is not so simple. They have actually two products. One is naked info, another is interpretation. In other words interpretation means propaganda. I don't want to pay for propaganda, do you?